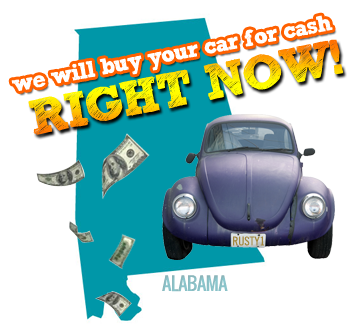 We Buy Junk Cars in Alabama. Sell Your Junk Car Today For Cash & Get Top Dollar + Free Removal. If you’ve ever wondered what you should do with that old, broken down junk car just sitting in your garage or rotting away in the far corner of your backyard, then Rusty’s Auto Salvage is the answer to your dilemma. Rusty’s Auto Salvage buys junk cars all across America. Our system is slowly becoming one of the most frequented and popular junk car buying systems in the country. We maintain a network of salvage yards and junk yards across every state that give you a chance to get cash for your junk car and we make sure that you get the maximum value for it. Types of junk cars can range from old broken down cars to high mileage cars, damaged or wrecked cars, as well as junk trucks and vans. Remember, the car doesn’t have to be running for you to get a good price. If the car is not being used and just sitting there you might as well make some money off of it. If you do not own the vehicle already, make you obtain the title to it. We can’t purchase the vehicle if you are not the owner. In Alabama every town, city, and county in the state is covered by one of our towers. We are extremely reliable when it comes to towing your vehicle and usually remove it the same day you call if you do so before 5PM AL Time. Not to mention the removal is free! How much cash you’ll receive will depend on the vehicle’s condition and whether we scrap, salvage, or just dump your car. Call Rusty’s Auto Salvage now for a free quote which usually takes no longer than 2 to 3 minutes. We look forward to doing business with you! Rusty's gave me a great price for my Ford explorer the experience was good as far as picking the vehicle up.I would refer anyone to rusty's. Rusty's gave me a fair price for my vehicle and was completely professional throughout the process. They took the time to carefully answer all my questions. Set up an appointment with your AL tower. You do not have to be present at time of pickup - alternative payment arrangements can be made. Arrangements for junk cars in Alabama missing keys, registrations and/or titles can usually be accommodated.